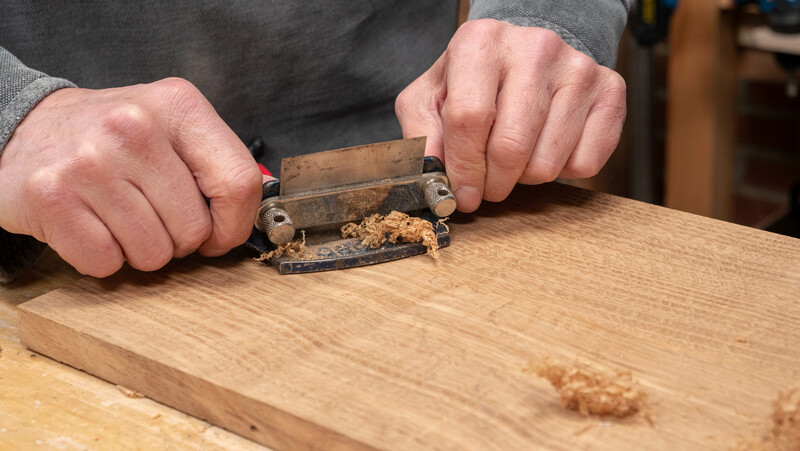 Ensure all your boards have been trued and are square, to see how to do this, see our Truing Stock guide. 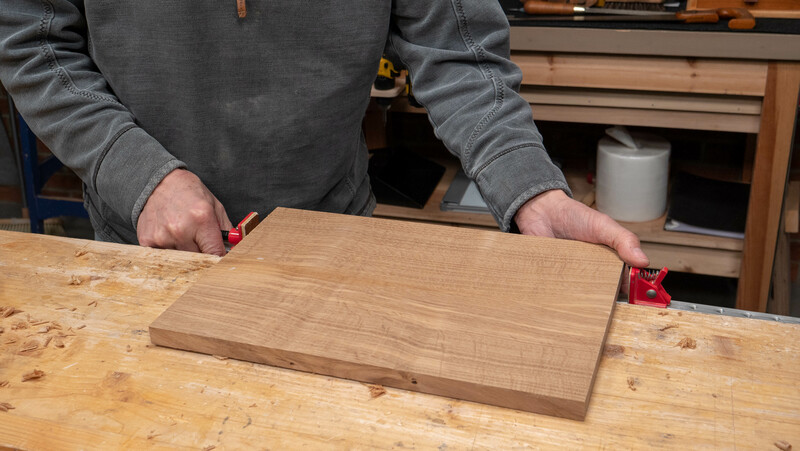 Lay the boards flat on a large surface such as the workbench top to decide their configuration. Then, put your boards together and align the edges on two pencils. 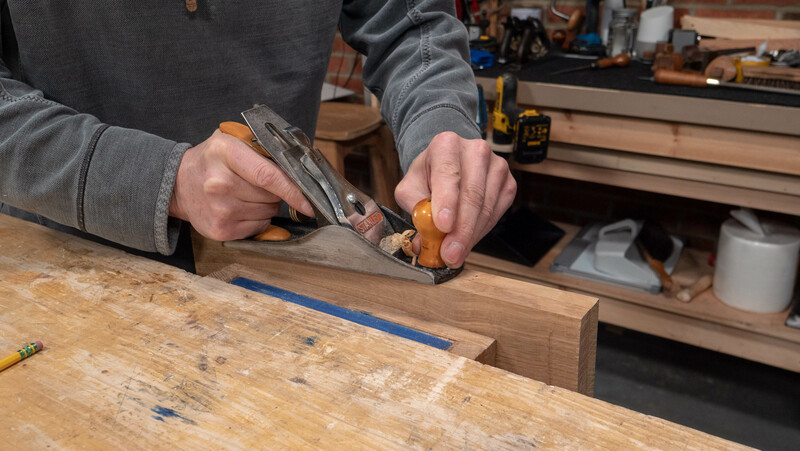 Pinch both your boards together and place them carefully in the vise. Use a plane to take off the high spots and get them so that they are the same level. 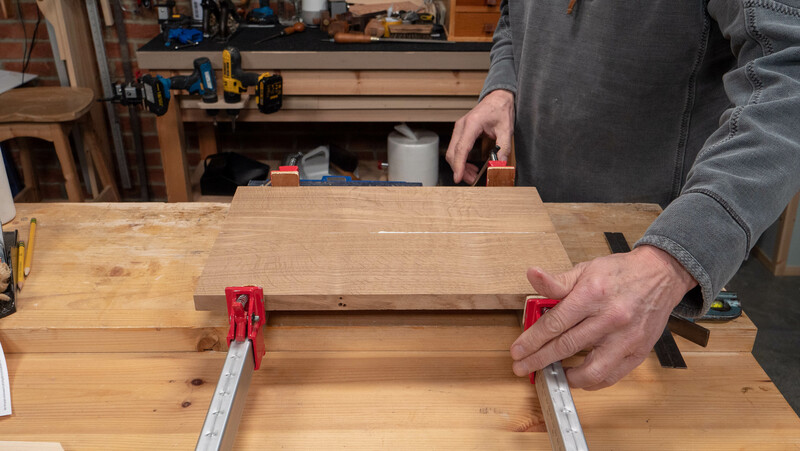 Once you are happy your boards are straight and true with no gaps, zig zag the glue along the edge of one of the boards then use the second board to even out the glue over both surfaces. 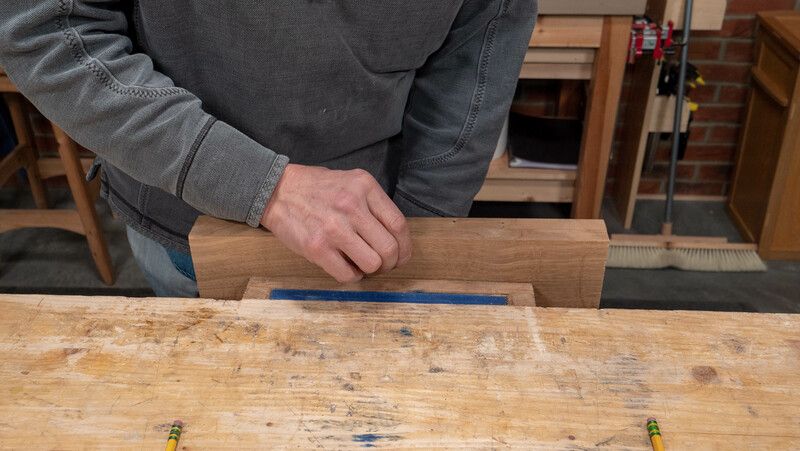 Use two clamps to hold both glued surfaces together. 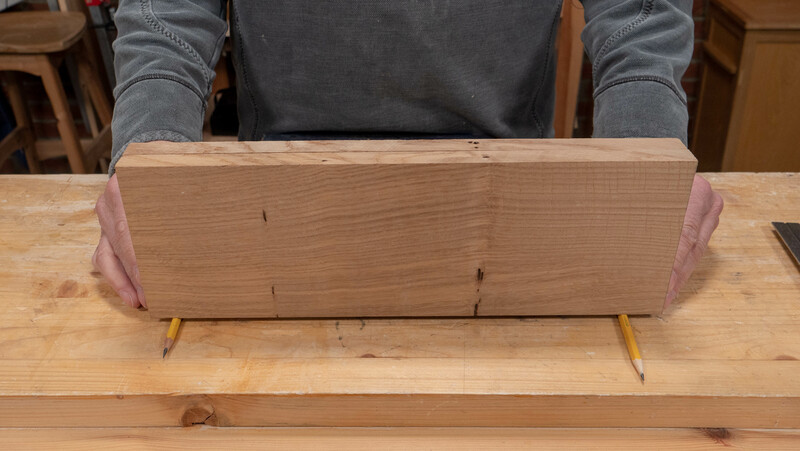 Put a third clamp on top of the boards to prevent uneven pressure that will often cause a bowing up. This then helps to squeeze out any excess glue. 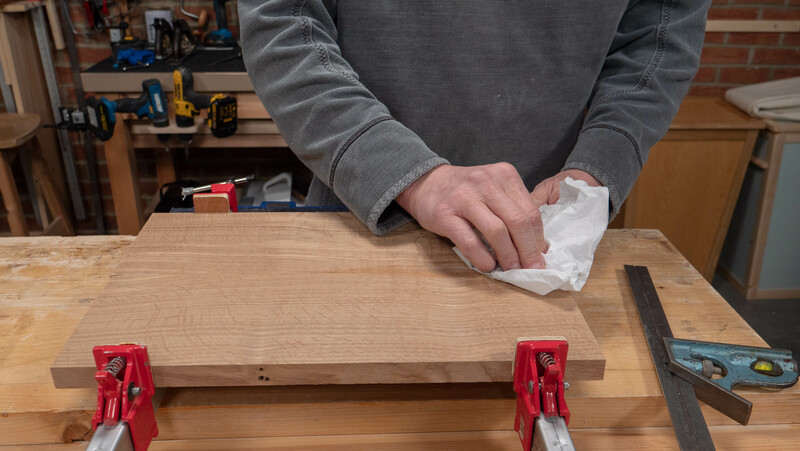 Wipe away any excess glue with a tissue. 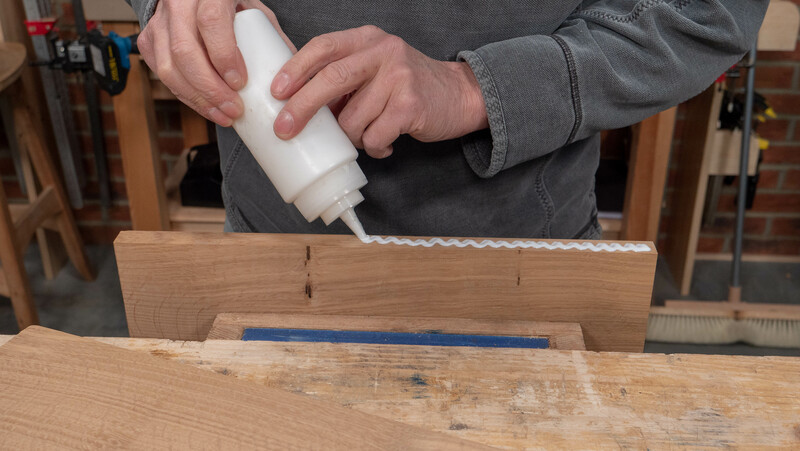 Keep in the clamps for approximately 8 hours so that the glue has time to dry. Once dry, cut to the size you need. Plane the newly sawn edges. 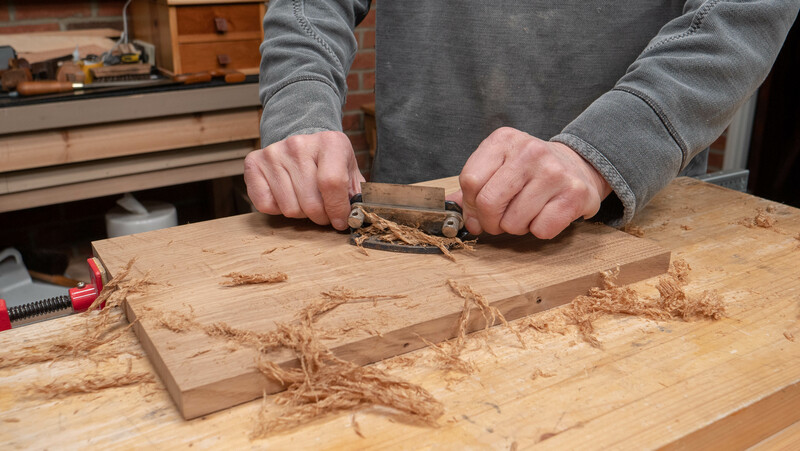 When planing the end grain, be sure to avoid the ends splitting by planing in halfway then coming from the other side. 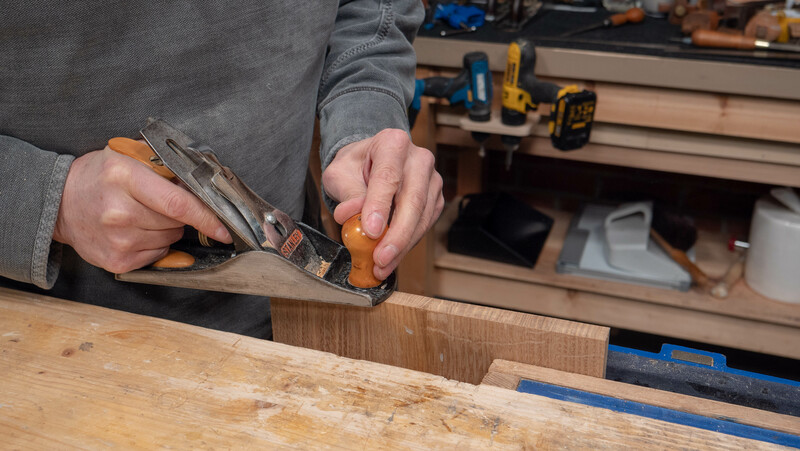 Place the clamp in the vise and use it to hold the board while you scrape the surface. 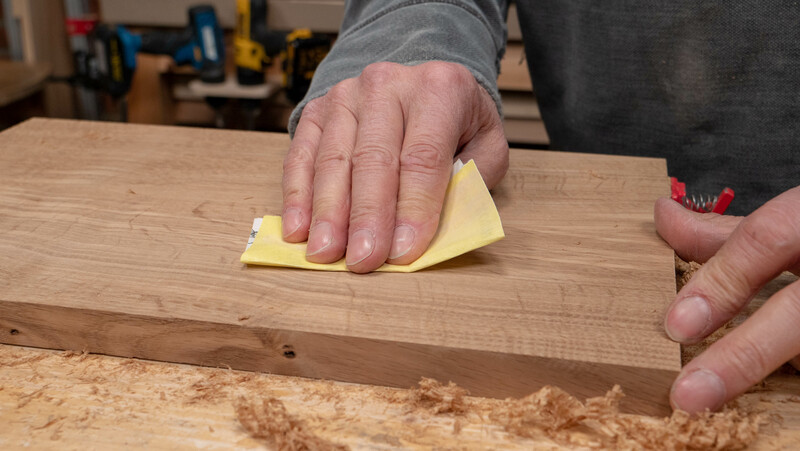 Use a #80 scraper to even up the surface and remove the glue. Finish off with sandpaper. 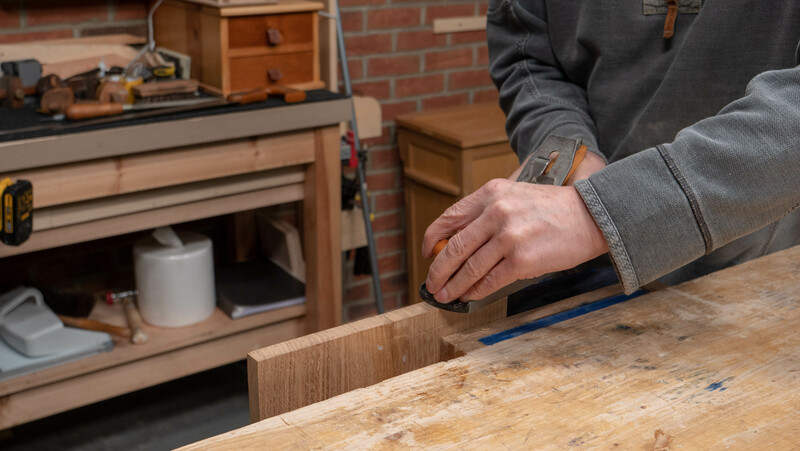 What if you need to glue up more than 2 boards? I can see that the technique works for boards of equal width, but what if the widths differ and you want to use them with varying widths? How would one proceed to get the edges to be glued even? Thank you, once again, for all you and your team do for us! 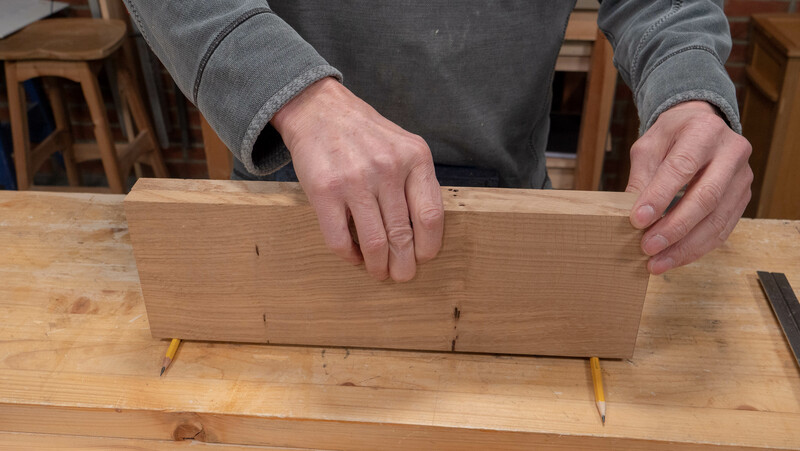 @BobHutchins- Just pinch the boards together as shown and use the edges that are lined up on the pencils as your jointing edges. 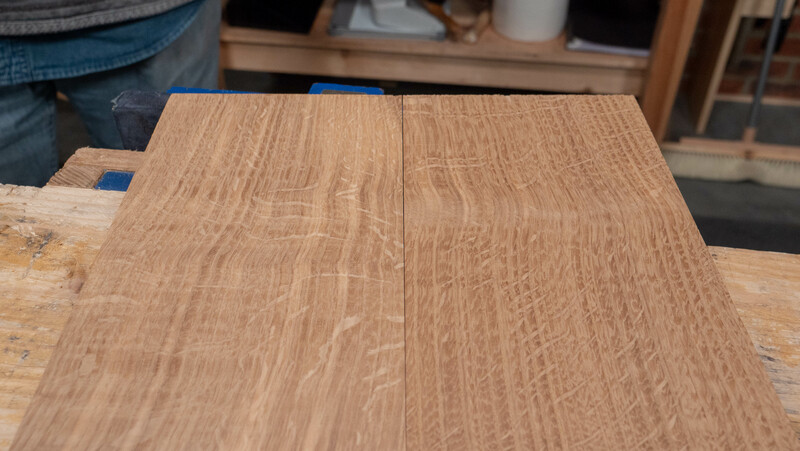 This will work even if the boards are of unequal width or are tapered. 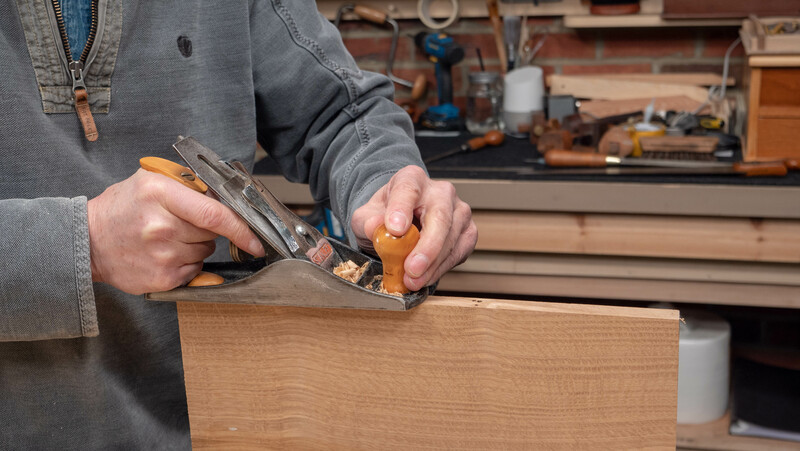 If you are gluing up 3 or more boards you have to joint each pair of joined boards separately. 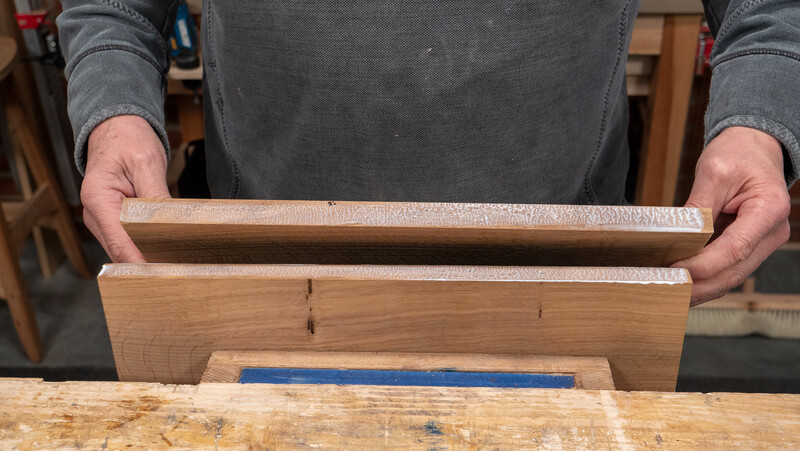 You would joint the first pair, say board 1 and the middle board, then use the other edge of the middle board and board 3 as your second joint. 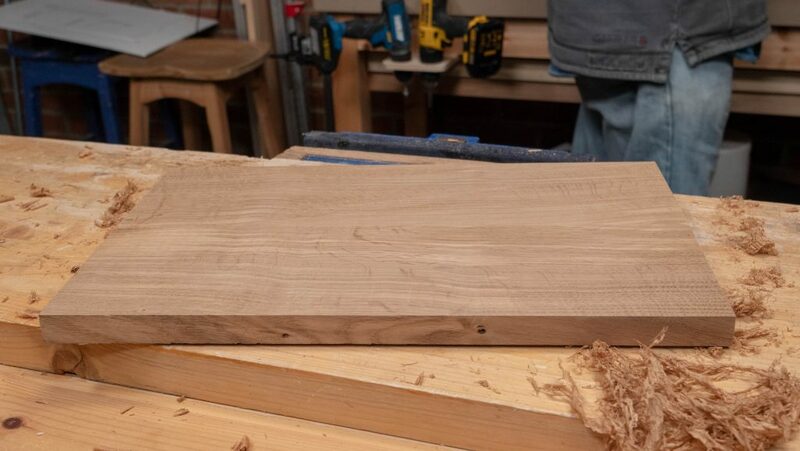 Make sure to first lay out your boards in the order you want them and then mark across each joint with a unique mark to keep the joints in order ( I use a pencilled slash mark on the first joint, 2 slash marks on the second joint, etc. This also helps with keeping the up side up). Hope this helps. 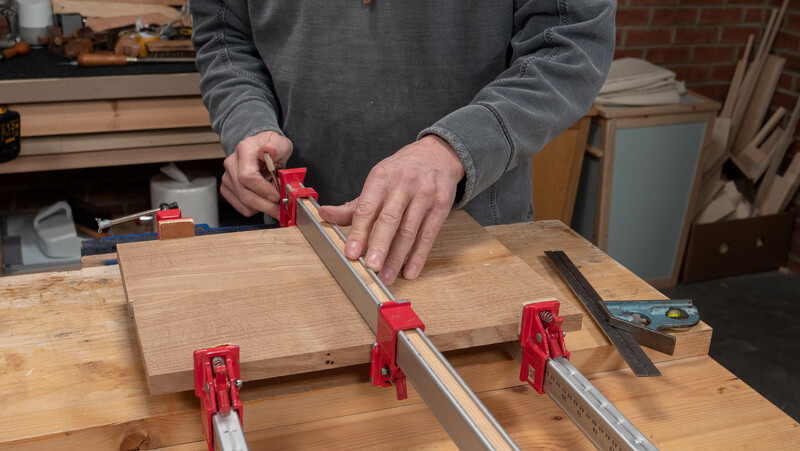 This system works for multiple board glue ups, you simply bring those edges together in pairs in the same way as a two board glue up, making sure that each corresponding edge is marked in some way to identify them. I have a wide board that is cupped so badly as to be unusable. 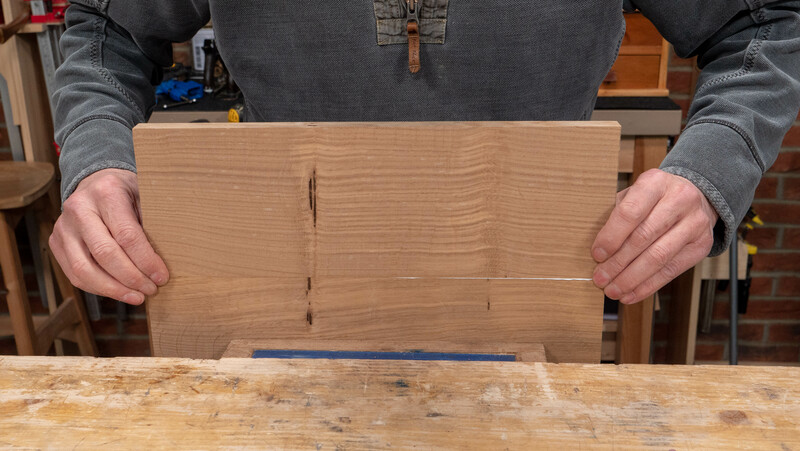 I plan on tipping it in half, flattening each half and jointing the edges to glue it back together. My question is, should I reverse the orientation? In other words, have the bark side of the boards facing in opposite directions? Paul says: no, now that it’s moved, if it’s stabilised you should be able to rip it, resurface it and reglue it without further movement. Im having issues with my glue. Its original titebond. It comes out like a runny pudding, i noticed yours is very smooth and flows freely. Is that an indication of bad or old glue? Usually, it is old stock even though you may have recently bought it. I have had it where it would not come out of the jug, the best thing is to return it as it definitely needs to be the right consistency of liquidity.